of reliable and consistent data. °C with an average increase of 0.06 °C per year (Shrestha et al., 2012). scientific findings to act upon. and some stunning photographs and Landsat images. I was also able to retrieve 1096 records on the subject of glaciers and climate change, from the CAB Abstracts database . Link provided for the benefit of subscribers of the CAB Abstracts database. Image credit: NASA Earth Observatory, Jesse Allen. in local ecosystems. PLoS One 7(5): e36741. Doi:10.1371/journal.pone.0036741. Previous Article IUCN releases list of 100 most threatened species – priceless or worthless? I am impressed, I need to say. Actually not often do I encounter a weblog that is both educative and entertaining, and let me let you know, you’ve hit the nail on the head.Thanks a million and please carry on the good work. 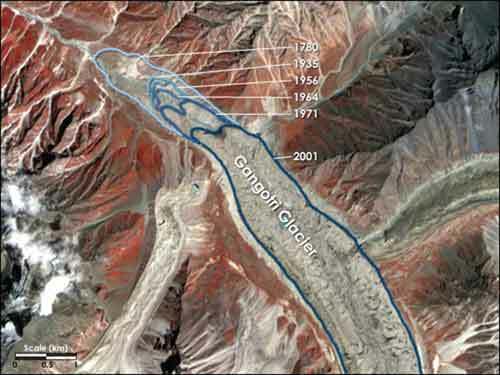 I am much intrigued with the new glacier geomorphology esp. Himalayas. Can you please link with more related information and data.